The gardening sections in second-hand bookshops are irresistible magnets to me, so I had no hesitation in stopping when I spotted a used-book shop as we passed through Cooma on our way to Kosciusko National Park a few years ago. There were no orchid books, as such, but my eye spotted one with the intriguing title, Tom’s Weeds. How could I resist it, especially with its price tag of $7! Tom’s Weeds is the story of the British nursery, Rochford and Sons, the biggest houseplant nursery in the world – or at least it was when Mea Allen wrote the book in 1970. The story begins when Tom Rochford bought land and set up a nursery in the Lea Valley near London in 1876. In due course the business was passed down to his son Tom II and grandson Tom III. Initially the nursery specialised in lilies of the valley, which were ‘retarded’ by refrigerating the crowns; on demand, the crowns were allowed to thaw and then stored in the dark until the flower buds appeared, whereupon the plants were transferred to pots. Thus the nursery was able to produce a steady stream of lilies-of-the-valley for sale throughout most of the year. By 1897 Rochford’s glasshouses would have extended over ten miles if placed end to end. The nursery raised a wide variety of plants, including lilies, grape vines, ferns and orchids. 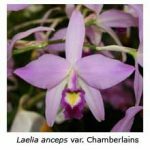 The orchids were grown for supplying cut flowers; there were two glasshouses filled with Cattleya labiata, and another with Cattleya warscewiczii and other cattleya species. 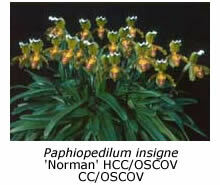 Several houses were devoted to paphiopedilums, especially Paphiopedilum insigne. 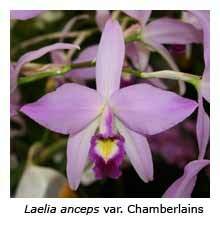 Laelia anceps, Vanda coerulea and Dendrobium nobile were also grown in great number. The nursery had twelve glasshouses containing 100,000 odontoglossums, predominantly Odontoglossum crispum, collected in Colombia by the plant collector James Carder. Tom Rochford was a keen exhibitor at various Royal Horticultural Society shows, and he was a member of the RHS Orchid Committee, which was (and still is) the judging panel responsible for granting orchid awards. Following Tom Rochford senior’s death in 1901, the company continued to prosper, despite ‘mishaps’ like the loss of £1000 of palms en route to Philadelphia when the SS Titanic hit an iceberg and sank on its maiden voyage. 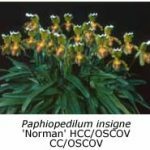 In 1905 there were warning signs that orchids were losing their popularity, and so many of the orchids, including the large collection of odontoglossums, were gradually sold. Just as well, because World War I was on the horizon, and most of the glasshouses then had to be used for growing tomatoes, cucumbers, grapes and other produce. The Great Depression followed, and then the Second World War. The heyday of orchids was well and truly over. Rochford’s nursery muddled through but was almost spent at its end. Fortunately, Tom III safely returned from North Africa, where he had been a major in charge of procuring and distributing sufficient food for both the British armed forces and the entire local population. The business acumen that he acquired there stood him in good stead to re­build the nursery. It was his idea to concentrate on houseplants (foliage plants), despite the derision of other nurserymen (including some of his fellow directors), who referred to them as “Tom’s Weeds”. Rochford’s gradual expansion into indoor foliage plants was an outstanding success and by 1970 Rochford’s nursery was selling a million houseplants each year – the largest nursery of its type in the world.